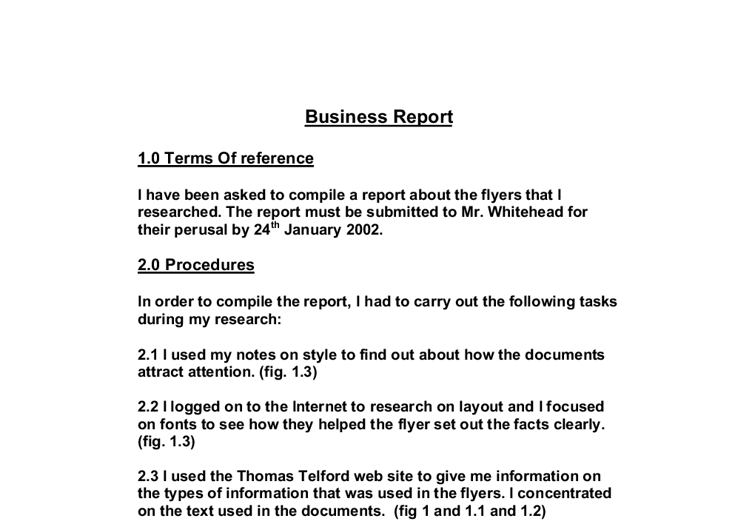 Business Report 1.0 Terms Of reference I have been asked to compile a report about the flyers that I researched. The report must be submitted to Mr. Whitehead for their perusal by 24th January 2002. 2.0 Procedures In order to compile the report, I had to carry out the following tasks during my research: 2.1 I used my notes on style to find out about how the documents attract attention. (fig. 1.3) 2.2 I logged on to the Internet to research on layout and I focused on fonts to see how they helped the flyer set out the facts clearly. (fig. 1.3) 2.3 I used the Thomas Telford web site to give me information on the types of information that was used in the flyers. I concentrated on the text used in the documents. (fig 1 and 1.1 and 1.2) 2.4 I used the Thomas Telford web site to research on the presentation used. I focused on the graphics and colours in the flyers I researched. ...read more. 3.4 Presentation Presentation is probably the most important part of the flyer. The graphics can attract the attention but too much can put off the reader and make them confused. The graphics include different colours and different fonts. These help the flyer attract attention significantly. 3.5 Standards The standards and the rules that are applied to the flyer are also very important. The name of the company should always be on the document and a contact number and address is also important. This shows that there is a real company behind the flyer. 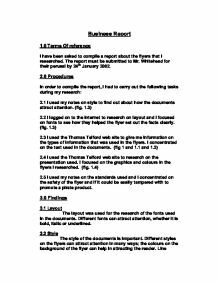 4.0 Conclusion I have now compiled a report to hand in to Mr Whitehead on the 24th January 2002. This report includes information on the different types of techniques used to create a successful flyer. These techniques include fonts, line spacing, graphics and text. 5.0 Recommendations The best layout feature is the fonts. They are the best way to attract attention. ...read more. Too much text does spoil the flyer though because it would be too confusing for the reader if there was a pile of text with no spaces in between or with no pictures or numbers to help. The best presentation is the graphics. Like text, too many graphics spoil the document. Graphics help attract attention by jumping out at the reader. Many of the flyers that have caught my attention have colourful graphics. The standards of the flyer are also very important. If the flyer was advertising a product that a reader bought and it broke, the reader would want a contact number or an address so they can replace it or fix it. The address or number included on the flyer will let the reader know that the company is reliable and there if something goes wrong. Appendices Look! Look!! Look!! Fig. 1 Look! Look! Look! Fig. 1.1 Look! Look! Look! LOOK! Look! Look! Look! Fig. 1.2 Brand New Car Only 9995!!!!! Call 01270 ......... Brand New Car 9995!!! Call 01270 ...... Now!!! Fig 1.3 Buy this house now!!! BUY THIS HOUSE NOW!!!! Fig. 1. ...read more. I think that their placement is very successful. First of all, they are situated at the entrance of our town. People can learn information about Tambov goods on the way to Tambov. Secondly, the most essential part of hoardings are situated along two main streets: Sovetskaya and Internationalnaya. Personal selling has the advantage of being more flexible in operation. Sales people can tailor sales presentations to fit the needs, motives, and behavior of individual customers. Also, sales people can see the customer's reaction to a particular sales approach and then make the necessary adjustments right on the spot. I will need to know about the consumers in a local area to the shop (harrow near shopping centre) Product- the products will obviously be mobile phones. Slash will provide different mobile phones from the latest phones to the old cheap and cheerful ones. The show along with the Internet web site HobokenHappenings.com and HobokenHappenings.TV will create an additional marketing resource for businesses in Hoboken and the immediate surrounding areas. Competition will be inescapable and unavoidable: New York City media centers distribute services to a larger market, New Jersey media outlets compete on a regional platform. Advertising Brands * Advertising is also used to create and modify brands. * Branding refers to the creation of a special set of qualities for the product or service. * This is a brand "identity" which consumers can recognise and identify with, and which will separate or differentiate the product or service from competitors. More of the writing is on the opposite side of the flyer, On this side it has the name of the car and a price in a blue/purple colour it is in a bold, similar to times new roman font and takes up most of the flyer, about size 36, this is to attract the reader.